There are plenty of other attractions in and around Eilat such as the underwater reef observatory and marine museum, the Yotvatah safari and the Timna park (pictorial) with some of the oldest copper mines in the world. I also ventured on the ancient incense route on which Nabateans (~5th century BC - 7th century AD) used to transport perfumes from the Arabic Peninsula through the desert for 65 days on Camels-back to the Mediterranean ports to be carried to Europe. This civilization of nomads (much like the more modern day Bedouins) forbade agriculture and permanent house building, and guarded their secrets of desert crossing for centuries. They had their own maps and road signs, their well hidden desert water cisterns and were able to prosper and achieve great wealth. They did eventually build permanent homes and a beautiful stone carved capital in the city of Petra in the adjacent modern day Jordan. One of their large cities was unearthed in Israel at Ovdat, and was eventually built over by the Romans. After being incorporated in the Roman Empire and their desert routes bypassed by the Romans the Nabatean’s relevance declined as did their civilization. Unfortunately they disappeared without leaving any written documents. 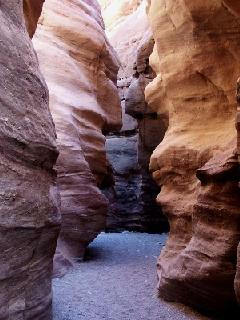 The Eilat Mountains hide the beautiful Red Canyon (right) which was carved in red Magmatic rock. Most of the Negev desert mountains are however sedimentation rock. Due to an unusual phenomenon this became eroded in a huge crater in Mitzpe Ramon giving rise to the largest such crater in the world the Machtesh Ramon (measuring 25 x 6 miles - 40 x 9 km). Interestingly in Mizpe Ramon (which is at the high edge of the Machtesh) the summer temperatures average a pleasant 80 F(25 C), while only a few hundred yards away if you descend into the huge crater the temperatures are much much higher.